Gooseneck vs 5th Wheel Hitch: What's The Difference & Which Is Better? You are here: Home / RVing Terms / Gooseneck vs 5th Wheel Hitch: What’s The Difference And Which Is Better? Gooseneck vs 5th Wheel Hitch: What’s The Difference And Which Is Better? When it comes to RV trailer hitches, you may have heard of a gooseneck hitch. These are different from 5th wheel hitches. A gooseneck hitch is normally used for industrial trailers, while a fifth wheel hitch is for recreational use. If you only plan on towing a fifth wheel and not a gooseneck trailer, go with a fifth wheel hitch. That said, there are reasons to have a gooseneck hitch on your truck even if you're towing a fifth wheel. Read on to learn more! Note: The one shown above is a CURT 16055 Bent Plate 5th Wheel Rail Gooseneck Hitch. Gooseneck hitches are often rated up to 30K, but that capacity is limited by the capacity of the brackets used or by the towing capacity of the vehicle (whichever is less). What Is A 5th Wheel Hitch? A fifth wheel hitch does not have a ball mount. Instead, your trailer connects to the fifth wheel hitch via a downward-facing pin -- called a king pin -- along with a plate that rests on top of the fifth wheel hitch plate. Note: The one pictured above is a B&W Companion 5th Wheel Hitch RVK3500, one of the highest rated fifth wheel hitches on Amazon. Fifth wheel hitches are also available in capacities up to 30K, but a max capacity of 24 or 25K is more common. Again, the true capacity of your towing system will be limited by the capacity of the lowest rated component on your truck. Gooseneck vs 5th Wheel: Which Is Better? 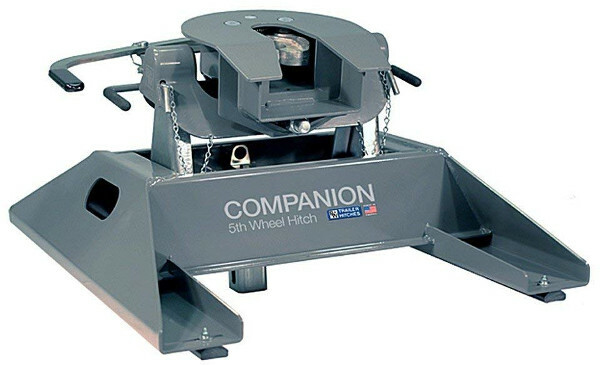 A 5th wheel hitch usually has a smoother ride, which can be further improved by upgrading to an air-ride pin box. This addition helps dampen road shock from the tow vehicle. That said, if you plan on towing both a gooseneck trailer and a 5th wheel trailer, you can also use a gooseneck-to-5th-wheel adapter plate. Keep in mind that you should always use the correct hitch for the correct trailer. Adapters can be hard on the frames of the fifth wheel, and in some cases, their use can void manufacturer's frame warranties.